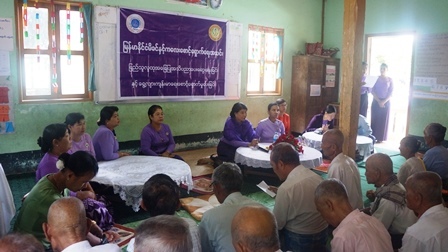 Home » News » Conducting Mobile Clinic at Sharr Saay Pho Village, Zayarthiri Township, Nay Pyi Taw Territory Region on 25th August, 2018. Conducting Mobile Clinic at Sharr Saay Pho Village, Zayarthiri Township, Nay Pyi Taw Territory Region on 25th August, 2018. MMCWA President Prof: Dr.San San Myint Aung, Vice President (2) Dr. Tin Nyo Nyo Latt , Central Executive Committee member Daw Than Than Sein and staff, IPPF Project Executive Director Dr. May Chan Oo, eye surgeon and group from Pyinmanna 200 bedded hospital, dental surgeons from Nay Pyi Taw 1000 bedded hospital, the focal person from Nay Pyi Taw Council Public Health Department, Chairman , Secretary and member of Nay Pyi Taw MCWA Supervisory Committee, Doctor of Myitta Sanyay Clinic(MMCWA) conducted the mobile clinic in Sharr Saay Pho village, Zayarthiri township, Nay Pyi Taw on 25th August ,2018. Firstly, MMCWA President Prof: Dr.San San Myint Aung delivered an opening speech. Presentation and discussion were carried out as follows; Hypertension and its complications by Dr. Thet Naing Oo, Adolescent Reproductive Health by Dr. May Chan Oo, Executive Director from IPPF Project, Antenatal care by Dr. Zayyar Moe, and Human trafficking by Daw Thuzar Lwin, Police Officer from Ministry of Home Affairs. Then MMCWA Members provided medicines and nutritious foods to the aged, babies’clothes, iodine salt, soaps, tooth pastes and tooth brush to the pregnant women and myitta sanyay magazines for the village library. In this community based mobile clinic, the aged, pregnant women, youths, patients and the focal persons from that village attended. There are 32 pregnant women, 145 elderly, 92 eye patients, 55 dental patients and 169 general patients, altogether 493 were taken care.